In the fast-paced world of health and safety regulation, it is important that your supply chain is compliant with the very latest directives. For industrial applications utilising metalworking fluids, the mandate is forever changing. Luckily for customers of ITW ROCOL, the Leeds based fluid management specialists are ahead of the curve in terms of legislation compliance. But did you know about the latest regulation on Formaldehyde use that arrived at the end of 2018? As of 1st December 2018, legislation changes have now seen formaldehyde releasing biocides reclassified as a carcinogenic category 1B H350 and mutagenic category 2. This means that all products will be carcinogenic and sensitising if they contain ≥0.1% releasable formaldehyde. Furthermore, they will be classified as mutagenic if they contain ≥1% releasable formaldehyde. The labelling for all products/formulations containing formaldehyde releasing biocides will now change. They will now need to include GHS08 and H350 phrase ‘may cause cancer’. Formaldehyde is a naturally occurring chemical compound containing hydrogen, oxygen and carbon. Everything from bacteria to plants, fish to animals and even humans produce formaldehyde as part of cell metabolism. What is a formaldehyde releasing biocide? Some bactericides used in metalworking fluids are classed as formaldehyde releasing biocides. They release small quantities of formaldehyde when subject to certain conditions. Known for its preservative and anti-bacterial properties, formaldehyde (present through the use of formaldehyde releasing biocides) has been used successfully in metalworking fluids products for many years. Why is it used in Metalworking Fluids? Water miscible metalworking fluids are highly susceptible to bacterial and fungal growth. This is caused by the environment and nature of the fluid. Sources of contamination can include tramp oil in the system, operators handling components and setting jobs, the incoming water supply and swarf from the workpiece. As the fluid is highly susceptible to bacterial growth it can cause serious problems if not properly maintained. These issues can include bad odours, skin irritation, short sump life, fungal growth and blockages. As they can quickly destroy fresh fluid and cause health problems to operators, it is of vital importance to eliminate and control the growth of bacteria in metalworking fluids. Some products could retain acceptable hazard labelling whilst maintaining a high standard of performance – naturally these would demand a higher price as the technology required is costlier. The general cost of metalworking fluid products could increase. The new legislation means alternative technologies, raw materials and formulations need to be developed and implemented, this comes at a cost to the manufacturer. Working in anticipation of the legislation change, ROCOL has worked for some time to replace biocides in its products with alternative biocides that are not formaldehyde releasing before the 1st December 2018 legislation change. This will avoid classification of carcinogen category 1B H350 whilst ensuring performance characteristics will not be compromised. Due to reclassification of other raw materials under REACH, the labelling of some products will change; for example, GHS05 and GHS09 will be common with metalworking fluids. Whilst the labelling on your barrel is changing, it is very important to remember that this applies only to the concentrate held within the barrel. Once the concentrate is mixed with water, the hazard labelling will not apply. So, the actual risk to users is far reduced than what the hazard labelling suggests. What does this all mean for the metalworking fluid market? Undoubtedly, product management will become more and more important and the removal of formaldehyde releasing biocides potentially leaves fluids more susceptible to bacterial attack. Therefore, the day to day management of cutting fluids will be critical to all those who use them and wish to comply with COSHH 2002 requirements. It is likely that new technologies will be developed and formaldehyde release biocides will be phased out. If you have a responsible supplier, they will make sure your products are labelled correctly and will communicate any relevant changes. Should you wish to know more about what type of product you are using, and if there are any alternatives you should consider, then you should contact your local ROCOL sales engineer. 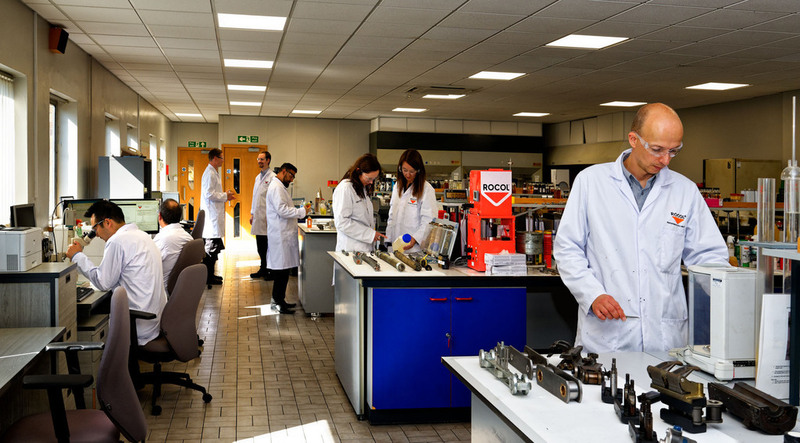 They can assist in the identification of your current cutting fluid type and offer a solution most suited to your environment.